The livestream for The International Dota 2 Championships is included in our roundup of feeds coming out of (or nearby) PAX 2012, but we're highlighting it here for you with a reminder that competition resumes at 12:30 p.m. EDT today with the semifinal rounds of the double-elimination tournament. Valve, maker of the game and sponsor of the tournament, is hosting two feeds on this site (in Russian and Chinese, too), and also is offering a free Dota 2 Spectator Client for viewing on Steam. It allows you to view replays of prior contests in addition to multiple camera angles, player stats, and commentary. Or you can check back in 90 minutes and watch it live from the feed below. 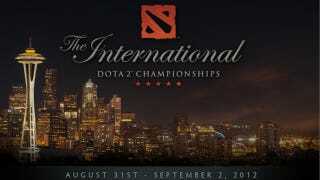 DOTA 2: The International (tournament).